Bulgari bling When it opens later this year, Bulgari’s first property in Dubai will add a new dimension to the city’s hospitality sector. Set to be the world’s fifth Bulgari Hotels and Resorts property, the luxury hotel is designed by Italian architectural firm Antonio Citterio Patricia Viel and Partners and will be located on the sea-horse shaped Jumeirah Bay Island. The expansive 1.7 million square foot complex will be framed by lush landscaped gardens and comprise 101 rooms and suites in the main hotel buildings, as well as 20 hotel villas. LA cool in Dubai Viceroy Hotel Group will open the doors to Viceroy Palm Jumeirah Dubai in April. Designed by Yabu Pushelberg and NAO Taniyama and Associates, the stylish 477-bedroom beachfront resort located at the base of The Palm Jumeirah, will offer each guest incredible views of the Arabian Gulf. The luxurious property will bring an ‘LA cool’ vibe to the region, featuring eight remarkable dining venues hosted by world-class chefs, a state-of-the-art 800-square-metre spa with 14 treatment rooms, three swimming pools, a beach club, children’s club, seven meeting rooms and a striking 700-square-metre glass ballroom capping the top of the building. The best of British Situated on the trunk of the famous Palm Jumeirah, DUKES Dubai, which will officially launch next month (April), offers a quintessentially British hospitality experience inspired by its famous London counterpart, Dukes London. The hotel, which soft-opened in January, is working with a range of top British suppliers, many of which will mark their UAE debut. Spread over 15 floors, the hotel will offer 506 rooms and suites and 227 fully-furnished hotel apartments. There’s a women-only ‘Duchess Floor’ too, with 20 rooms and dedicated facilities. The hotel also features an outdoor infinity pool with dramatic views and a private beach. Designer lifestyle Having opened its doors in November 2016, the legendary Italian fashion and lifestyle brand’s neoclassical masterpiece is reminiscent of a 16th-century palace, featuring the most opulent designs from House of Versace. Set in the heart of Dubai’s Culture Village, Palazzo Versace Dubai is plush in aesthetics and lush in verdure. Featuring 215 rooms dressed in bespoke Versace designs, the hotel is a haven of serenity as well as luxury, with several lagoon pools and reflection ponds elevating the tranquil atmosphere of the gardens. The hotel’s eight bars and restaurants include the conceptually-unique Enigma featuring limited-edition menus, as well as Q’s Bar and Lounge, which is music legend Quincy Jones’ first ever bar. A new address City lifestyle resort The Address Boulevard Dubai has opened its doors in the heart of the prestigious Downtown Dubai area. The luxury property features a three-tiered poolside oasis, elegant dining venues, a luxury spa and unrivalled city views. Standing at 368 metres, the 72-storey curvilinear tower is the second tallest building in Downtown Dubai after Burj Khalifa, and is the 36th tallest building in the world. 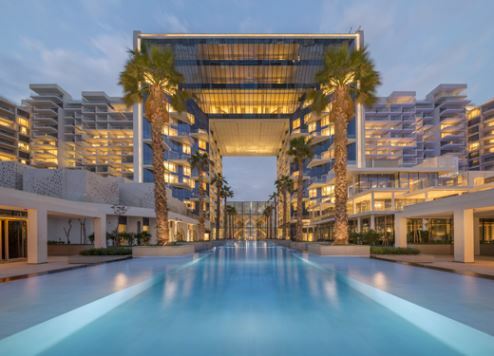 Affordable luxury on The Palm Dubai is building its reputation for affordable luxury with the announcement of the first four-star resort and spa on Palm Jumeirah, developed by R Hotels. Located on the East Crescent of the island, The Retreat Palm Dubai MGallery by Sofitel, due to open soon, will feature 255 rooms and suites plus modern recreational facilities including a spa, gym, swimming pool, sauna and steam bath. It will also focus on holistic treatments, offering guests wellness, fitness and nutrition programmes. Amenities and activities exclusively for children will include a fully-supervised indoor and outdoor play area, and special kids’ entertainment. New look at Hatta Fort JA Resorts & Hotels has revealed a sleek new image for JA Hatta Fort Hotel following an extensive renovation project. Set in the Hajar mountains, less than a two-hour drive from Dubai, JA Hatta Fort Hotel has retained its Arabian roots, but has been brought up to date with a fresh, modern look. Set in 80 acres of gardens, the hotel offers two swimming pools, a spa, gymnasium, field and target archery range, mini golf course, tennis courts and a mini zoo featuring ducks, goats and camel rides – perfect for families, corporate groups and families.